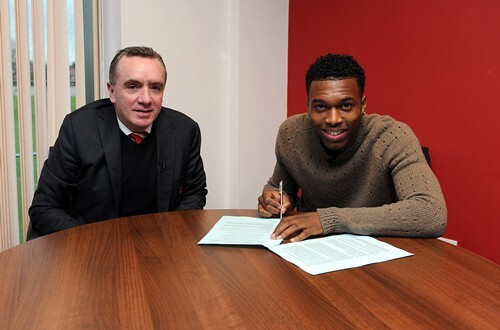 Liverpool Football Club is delighted to confirm the signing of striker Daniel Sturridge from Chelsea. The 23-year-old becomes our first signing of the January transfer window after penning a long-term contract at Melwood today. Afterwards he told Liverpoolfc.com of his joy at sealing the deal. "I am humbled and happy to be here," said Sturridge. "Brendan Rodgers said he sees me here for a long time - and I also see myself here for a long time. I've not signed here to play for a couple of years and then move on. "I've signed to be here for as long as possible. It's a humongous club - for me, one of the biggest in the world - and to have the fans and world-class players we have here is amazing." Sturridge began his professional career at Manchester City, where he finished top-scorer as City lifted the FA Youth Cup in 2008. In 2009 he signed for Chelsea where he established himself as one of the best young forwards in the country, firing 24 times during his stay at Stamford Bridge. His form at Chelsea led to full international recognition at the age of just 22. Having scored 21 goals in 34 appearances for England at youth level, Fabio Capello handed him a senior bow in a friendly against Sweden in November 2011. He has collected three more caps since and last summer scored twice for Great Britain at the Olympic Games. You must have set a nickname to post a comment. Click here to set your nickname. © Copyright 2014 Liverpool FC. All rights reserved.